Automate.io, a third party integration platform, helps automation by creating bots between different applications. Set up cross-functional workflows in automate.io to connect Zoho Mail and various cloud apps. You can create either one-to-one integrations or multi-app workflows as bots. You can also build your custom bots which can automate 100+ applications with your emails in Zoho Mail. 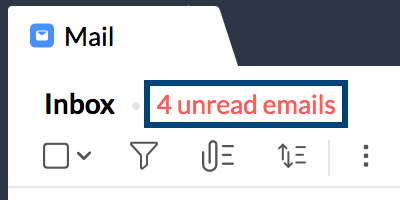 Stop an email before it reaches the recipient with Undo send in Zoho Mail. 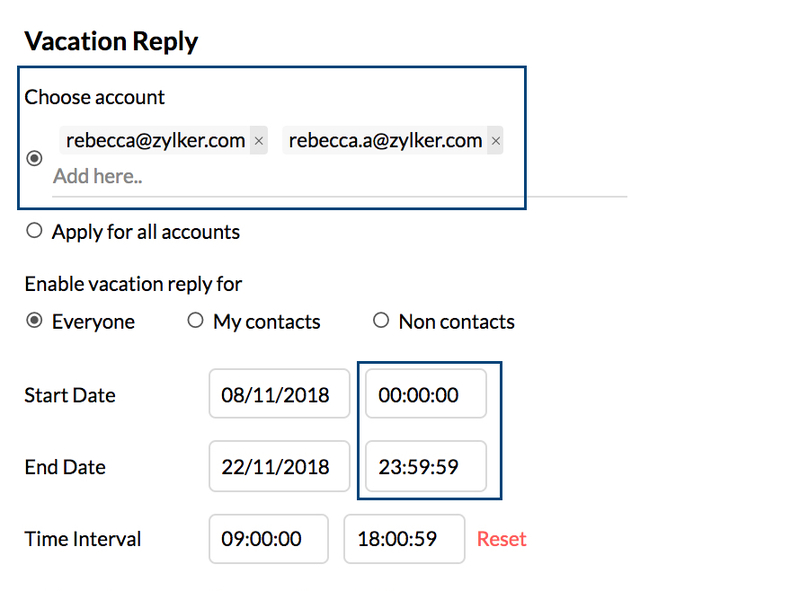 You can set up Undo send in Zoho Mail's compose settings and choose the duration for which you want the Undo option to be displayed after sending an email. Stop the schedule for an email from your Outbox folder. Click on the schedule icon next to the relevant email in the Outbox listing to unschedule it. Access internal and external application right from your mailbox using eWidget. You can manage all your integrations from one place. You can now set the Start and End time along with Start and End date for Vacation Reply. You can also choose which accounts you want to apply the vacation reply to. The encryption level of the emails you receive is displayed in the header of the email. You can also view the encryption level for sent emails in the Sent folder. You can add formatting to your Streams posts by using the Rich text editor options. Certain settings like Theme, Mail view etc directly using Quick Access without having to navigate to the settings page. If you frequently email the same set of recipients, you no longer need to type in all the contacts each time. On entering any two of the recipients from the group, other contacts frequently emailed alongside the entered contacts will be suggested. You can click on them to include them as recipients. 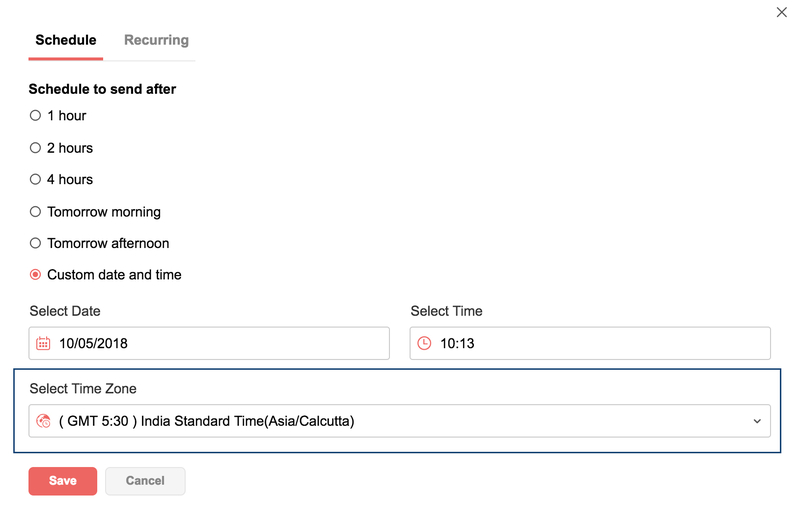 You can now select the preferred timezone while scheduling emails to your contacts. You can also change the selected timezone of the scheduled email from the Outbox folder. You can archive Streams posts by selecting the Archive option, provided that you are the post owner, group owner and group moderator. You get to decide if you want to include a signature while replying to emails by using the Signature in Replies toggle button in the Signature settings page. In the Templates folder, you will now find the Create Template button using which you can easily add a new template. Locate the Insert Template button in your email composer, search through your multiple templates using the Search option and select the required template with ease. Template categories can also be created from the Insert Template pop-up. You can now compose your emails in any font of your preference. Customize your font by using the System Font option in the Compose Settings. 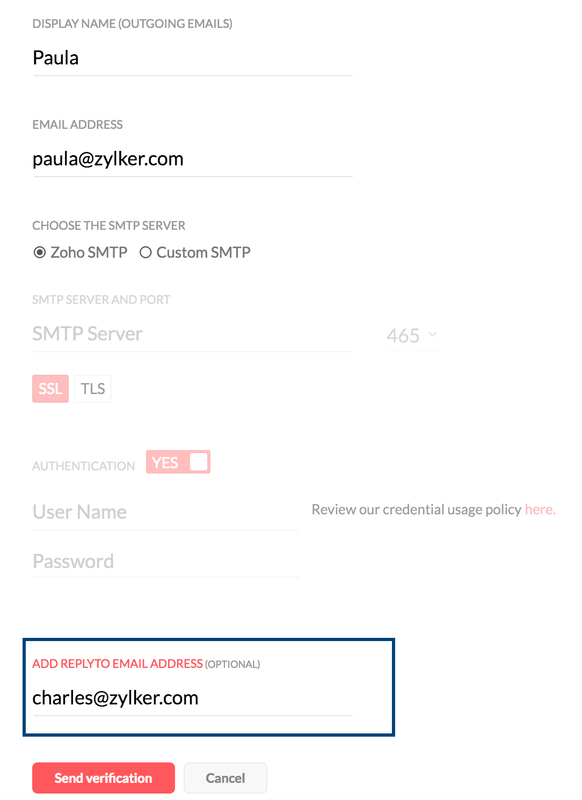 Configure ReplyTo email addresses for all your email addresses, including the aliases and the external POP accounts. Sort your email listing in a particular folder depending on the size of the emails. Makes it easier to locate those emails that might be taking up too much space! Choose whether you want to see the CC field while composing your email from the Compose Settings. You can turn it off later as per your requirement. Searching for those specific attachments have been made simpler with the addition of multiple new filter parameters. Access all the comments and feedback about your shared draft from a dedicated section on the right side of your mailbox. View the number of unread emails in a specific folder right next to the folder name. You can even click on it to view all the unread emails in the folder in one view. We're done away with the confusing mail thread count in conversations. Now, you can view all the unread emails in a particular conversation in the email listing view. Copy and move your Streams Notes and Tasks between multiple groups using the relevant option in the More Options button. Make the best use of your filters by combining the usage of both AND and OR logical conditions in the same filter. Play around and edit the criteria pattern for the multiple conditions you set, according to your preference, and Zoho Mail’s filters will ensure that your mailbox is as neat as ever. Almost everything you need to know about an email such as the email size, labels, date etc. is displayed in your listing. Choose just what you want to see in the listing using the customization options available now! It's no more a necessity to share entire email threads when you need to share just one email. The selective email sharing option lets you share specific emails from an entire thread of emails. You can also do much more than just comment from the comment box. Create a note or a task using the comment content and associate it with the email. Struggling to organise your sent emails everytime? No more worries. Just set up the outgoing filter, to automatically classify your sent emails. You can set up filters based on recipients, subject or if it has attachment or not. Learn more. When you come across email addresses in the webpage, you generally copy paste them to our editor to send an email. No more copy paste hassles. Just click the email link, to start writing an email. Follow simple steps to make Zoho Mail as the default composer, to enable this feature. Learn more. Have you tried the email reminders (Try now in case you haven't) feature in Zoho Mail? You might have noticed the dismiss option along with the email/ task reminder notification. We have now added the 'Snooze' option to remind you sometime later. The inline images we send, are often to emphasize an error or denote some specific area. Now add more context to your screenshots by adding correct annotations then and there without any additional tools. Whether you paste an image or insert the image, use the annotation options to highlight, write notes and add insights to the image you pasted. You can also use the more option to add hyperlink to your images, in case you want to link your logo to your websites or social media pages. Learn more. You can now choose to mark certain language images as Spam. In case you often find offensive emails spamming your Inbox in a particular language, you can now blacklist the languages using the Spam filtering options. Learn more. Easily create categories from the address book and use them in your emails. You can now directly create a category from a set of contacts from the Address Book. Good news for the users who loved our older interface. The new 'Vintage' theme is now available to those who thought old is gold. 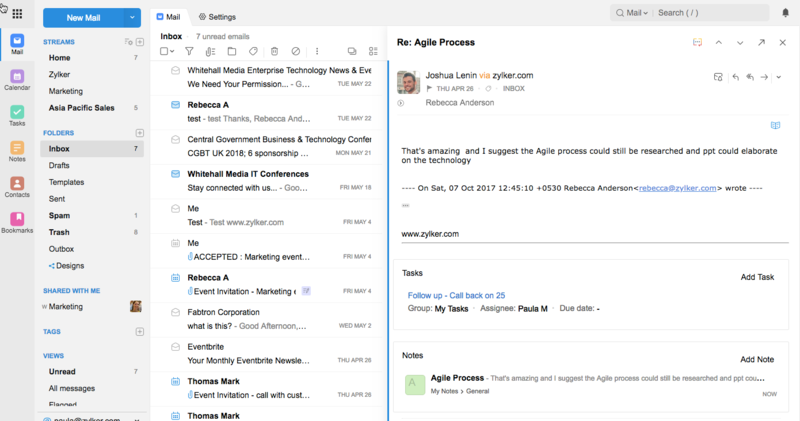 A new way to preview your emails in qiuick view. Those of you who have lesser vertical space, and want to use your screen's width in a better way can opt for horizontal preview pane, enabling you to read the emails below the list of emails. The width of the preview pane and the email listing panes can now be adjusted to your comfort. This also gives you the freedom to have the preferred width for reading your emails from the preview pane. In case you have devices with smaller screens, and have trouble in viewing emails even after adjusting the pane widths, you can go ahead and hide your Apps pane. You can easily show/ hide panes to switch between the apps and still have wider reading space. Coolest Interface - Zoho Mail 2018! 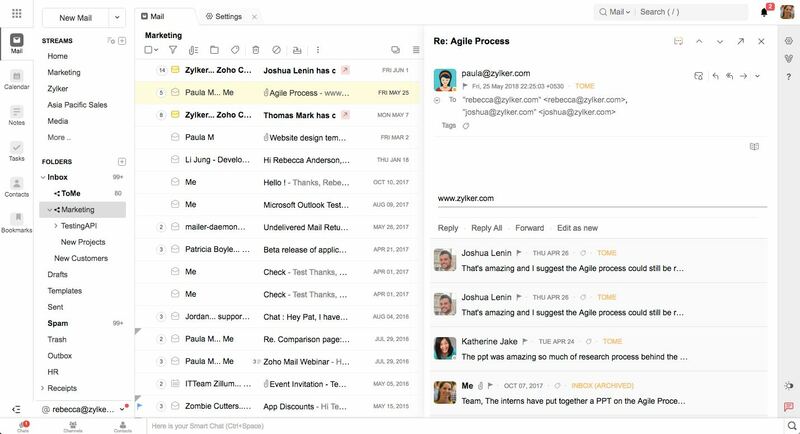 The coolest new interface of Zoho Mail, Zoho Mail 2018 was launched for all the users, with enhanced loading speed, intuitive actions and cleaner look. Along with the font family and font size, you can now choose default font color for all the emails you send. Richer Notes, with nice formats! You can now make your Notes look better with rich formatting options. This also ensures that, you can directly send them as email, using the Send as Email option, without having to format them all over again. Drag n Drop files from anywhere! You can now simply drag and drop attachments from within the email interface , from one mail to another or even direclty from the attachment viewer. 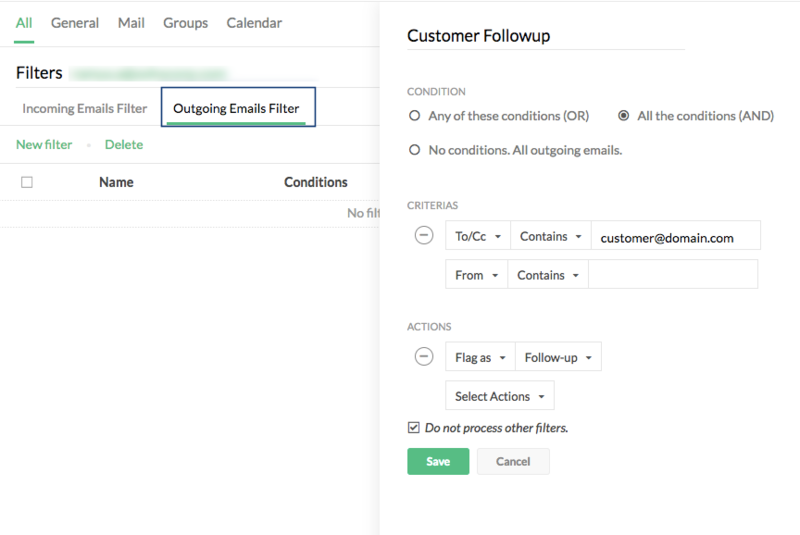 You can now enable/ disable the smart filters that classifies the automated emails as Newsletters or Notifications. Subfolders deletion under Trash : You can now delete the subfolders under Trash using the context menu. Refer here for more details. Contact card enhancements: You can now view the list of Tasks/ Notes created by the particular contact, from the contact details card. Refresh option for User Storage: When users delete their emails and empty Trash, they can view the change in their storage used using the Refresh option in the User Profile. Collaboration within your organization couldn't be simpler. 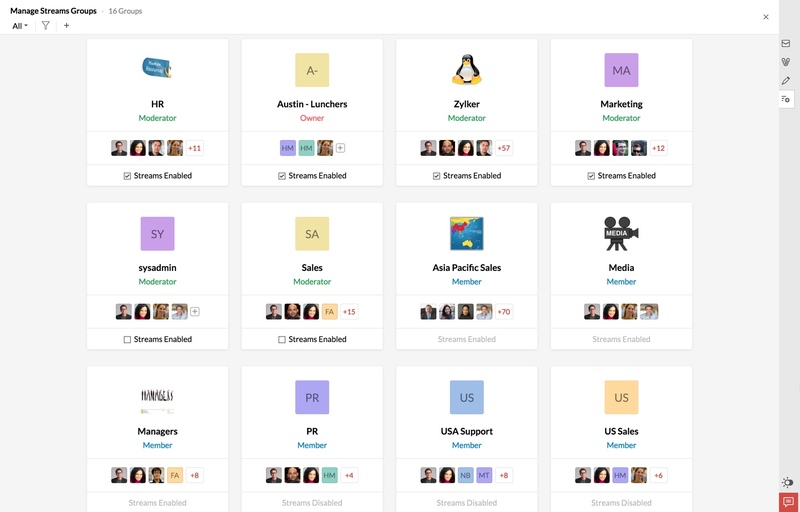 With an enhanced access to all your Streams groups from the left pane, make use of Streams for all internal communication. 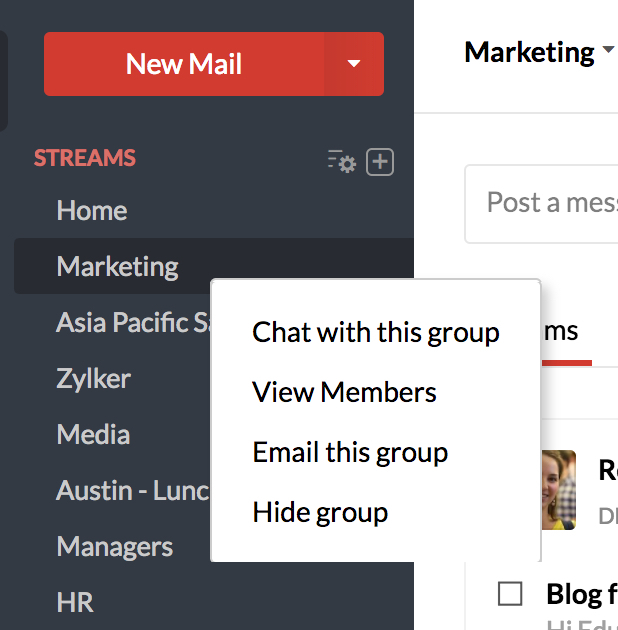 A complete listing of all groups that you’re a part of, lets you swiftly navigate between your Streams pages. Ever spotted a post and wanted to converse about it to the related members? Zoho Mail has integrated with Zoho Cliq to give you the Chatlet feature. 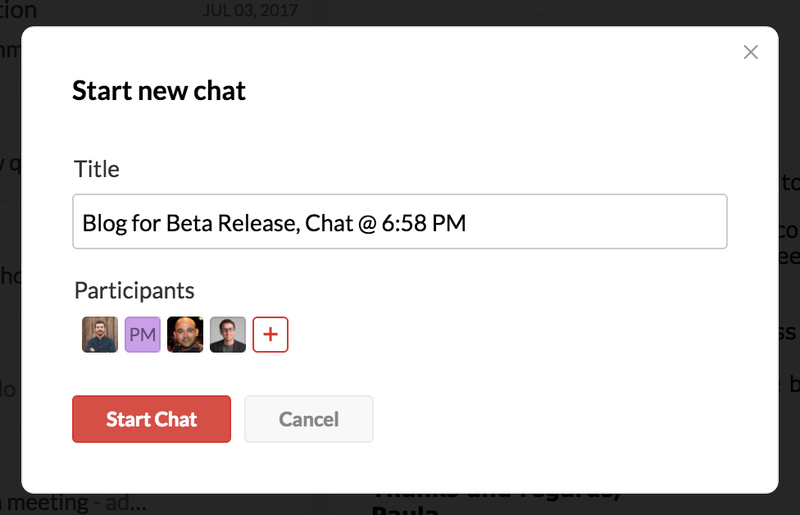 Click the Chat icon on the top corner of any email, Streams post, Task or Note to start a group chat with members involved in the post. You can also edit the chat participants. Just enter a title for the chat, and Cliq away! Managing your Streams Groups could not have been made more effortless. The Groups Management page makes it simple to create a new group from within your mailbox. The Manage Groups page is a unified view of all the groups that you are a part of. All your group related activities can be managed from the Group Management page. 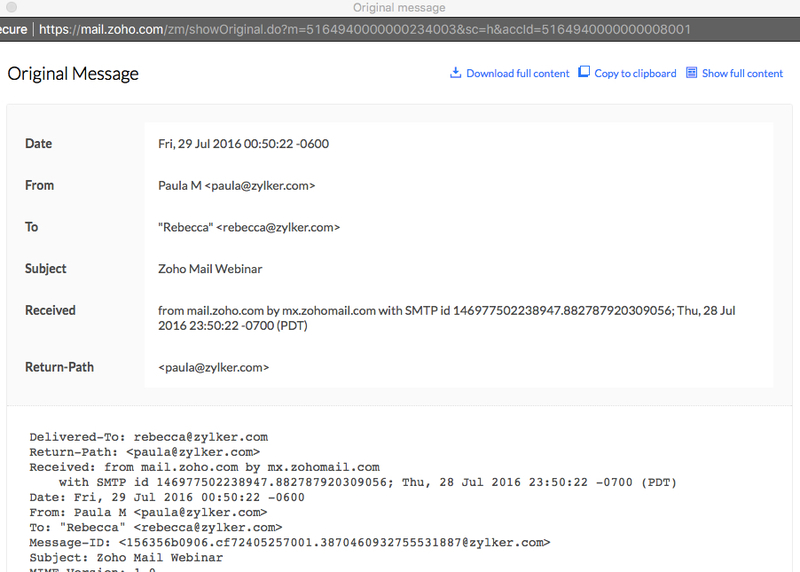 The emails in your mailbox can be directly attached to an email as an EML file. Just drag the email from the email listing and drop it into the compose window. Multiple emails can be attached at once by selecting them using the check-box and dragging and dropping them. Adding to the multitude of options in the email compose, we have now introduced options to edit the line spacing, and also to add a subscript, superscript in the email content. Adding to our current functionality in Tasks, a Group Task can now also be assigned to a non-group member. Know more. While configuring your Vacation Reply, you can now set a response interval. The response will be sent out based on the number of days specified in the configuration. Learn more. Any Streams posts that you have been invited to will be displayed in the Invites view in Streams. This tab will be available in Home Streams view. Learn more. Freedom from Phone hassles! Just Cliq and call your contacts right from your mail. Look up the contact right from the email to initiate a chat via Cliq. Better still have an in person conversation using the Audio/ Video call options of Cliq integrated right within your email. You can now create a workflow/ rule via Filters to automatically upload attachments from your email in Zoho Mail to popular cloud storage (Zoho Docs/ Dropbox/ Google Drive/ Box/ One drive) of your choice. 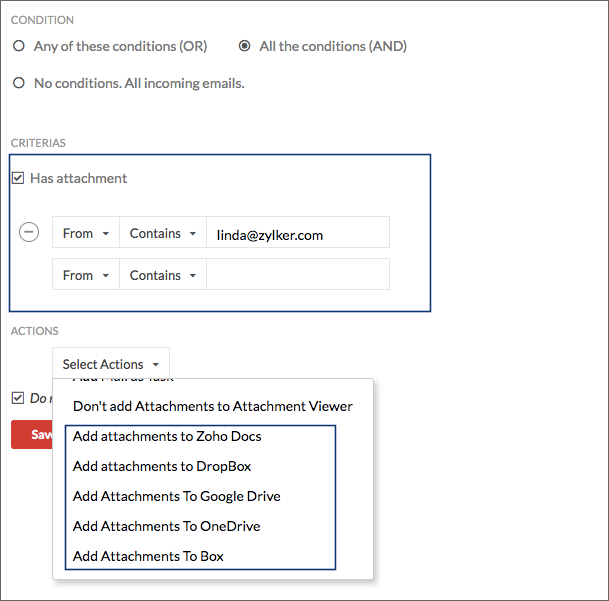 Just create a filter, with the conditions based on a combination of from / To/ Subject for emails with attachments, and choose the action to 'Add attachment to cloud'. Follow the steps to complete the authorization process and start uploading your files. Take a quick look at your listing and know which emails were replied to and which were forwarded in a glance. The mail icons in the listing, now have the indicators to subtly denote the status of the email, in addition to the read/ unread status. A completely revamped settings with collective card view to help you customize Zoho Mail to suit your preferences in a jiffy. Just click the relevant card to start changing your preferences. A versatile reader view to help you read long emails without any distraction is now available in Zoho Mail. You can choose your preferred font face, adjust font size, line spacing or even choose night view to read at your convenience, inspite of the original formatting in the email. You can now schedule your new emails for deletion, based on some conditions defined in Filters. Among the set of new actions, the option to define how long the emails need to be present in your Inbox is also available. Certain emails loose their importance, after they are read and may be needed for reference only for a few days after they are read. Create exclusive filter for such emails, with predefined conditions and schedule auto delete of such emails after 'n' days. Setting up contact forms to send emails from your Wordpress website is just a click away. You can install the Zoho Plugin in Wordpress directly to send emails using your Zoho Mail account without any sweat. You now know when a draft shared with you has been changed by its owner. You will notice a refresh icon, whenever a change is done in the draft shared with you that you are currently viewing. We have added some more languages (Bulgarian, Croatian, Bengali, Korean, Marathi, Telugu and Ukranian, to help you view Zoho Mail in your local language. Learn more. In cases where the account gets blocked due to usage or storage issues, the user will be notified using a banner along with a link to unblock themselves. Learn more. You can now choose from Organization category from the address book to quickly fill up multiple contacts grouped by your administrator. Learn more. Your profile information, storage details and account settings are now just a click away. Click your profile image, to have all the information at a glance. Get one click access to our range of mobile apps. Additionally, Admins can have renewal information and control panel at their finger tips. Get instant review for an email you are drafting. Just share the draft and ask your team mates to add their comments about the draft. Re-edit the draft, if needed and notify them about the changes, all right inside the draft. Scan important information in a glance. Getting, air tickets, vacation reservations by email? Read the flight information, hotel details right from the listing without even opening the email. Want to send emails, that show up as Email snippets? Just click the + icon to add new tasks/ notes/ bookmarks in a jiffy. Very handy when you have copied some information and add it here as a task/ note / bookmark. No formatting hassles to maintain same font face size and so on. Just use the format painter to copy a format and paint the same format to another section of text. The Tasks are in the cloud, available anywhere anytime. But having them on paper and striking them out does give a sense of accomplishment. The Print option is right there for you! Click the Print icon, to print your checklists, Todos and Tasks to manage them using Pen and Paper the old school way. We all have multiple sessions open. With sticky notes being handy for taking notes, having different versions in different sessions might be confusing. Now any changes made in a note in one session, is carried forward to all the sessions. Bookmarks list view: Based on the popular requests, Bookmarks can also be viewed in the list based view in addition to the Card view. Reminder mail enhancement: When you use the automatic followup and remind option, to remind the recipents, the reminder emails to your contacts are now more effective and contextual. The reminder emails now get sent using your own 'From' email address, thus making them seem to be actual follow up emails from you. 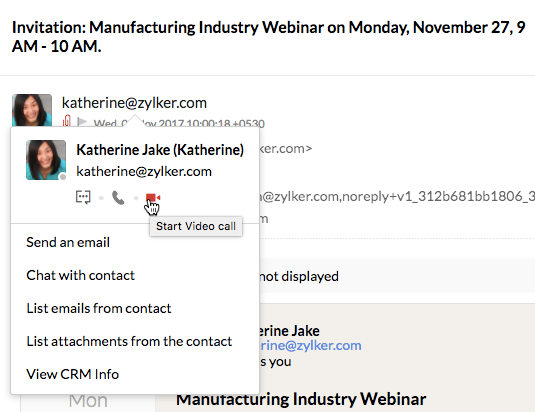 Actions inside your emails, are now more visible and actionable right from the listing. 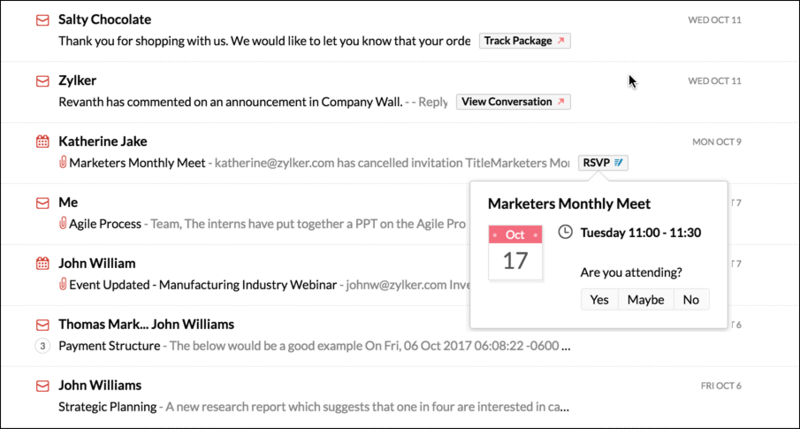 Quick actions help you to directly locate and act on the emails with actions, without even opening such automated emails. Tired of looking for complex technical information in internet headers of the emails? 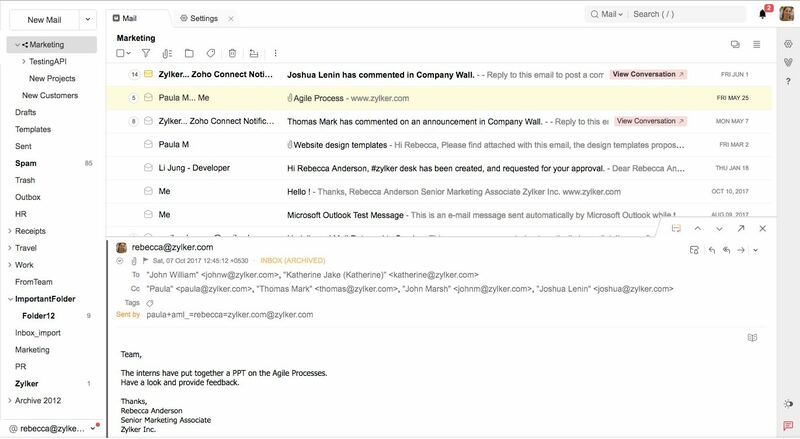 Email headers are now displayed in easily readable format with download and send options, making it simpler for admins to troubleshoot email issues. Display name and From address: To make sure that you know the 'Display Name' that is set for your account, the Display name is now displayed along with the From address in the email composer. Fine grained Search: You can now search for an email addressed to you in To vs an email addressed to you in the Cc field, instead of a combined To/ Cc based search. No more image hassles! Just paste the screenshot you captured, annotate it and embed the image right inside your email. Want to send it as attachment? Just paste it in the attachment browser, instead of pasting in the editor to send it as an attachment. 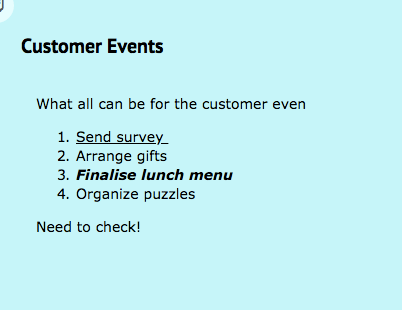 Get a birds eye view of all you Tasks from Zoho Mail. Be it your individual tasks or team tasks or tasks from your Zoho Projects, view them all under your Tasks and plan better. You can even add a task directly to your portal in Zoho Projects. An email can be associated with a Project Task/ Bug in a single click. Night mode - Only ideas need to be bright! Zoho Mail now sports night mode! 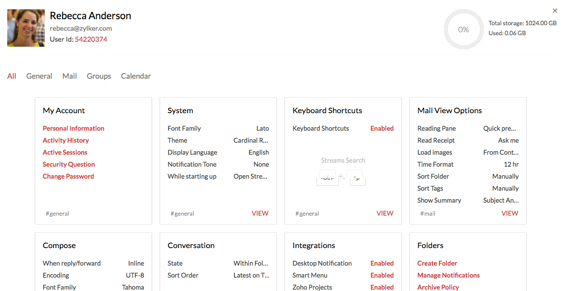 We have had so many requests for a darker theme and grumbles that our themes are too bright. We dedicate this 'Night mode' to all the night owls out there. Get a birds eye view of all the attachments in a specific folder. You can now easily locate the important files that came in as attachment in a particular folder without worrying about who sent or when it was sent. Learn more. Track sent emails - Sent or Not ?! Check out the delivery details of the emails you send in a jiffy. You can know whether the email was delivered to the designated person or not. You can even find out the reason for bounce in cases if the emails were undeliverable! More details. Sticky notes are excellent tools to jot down such random thoughts without losing the current context. Sticky notes gets pinned up on your mailbox until you sway them away. You can easily pull out information from different emails and sew them together as a note for your reference! Find out how! 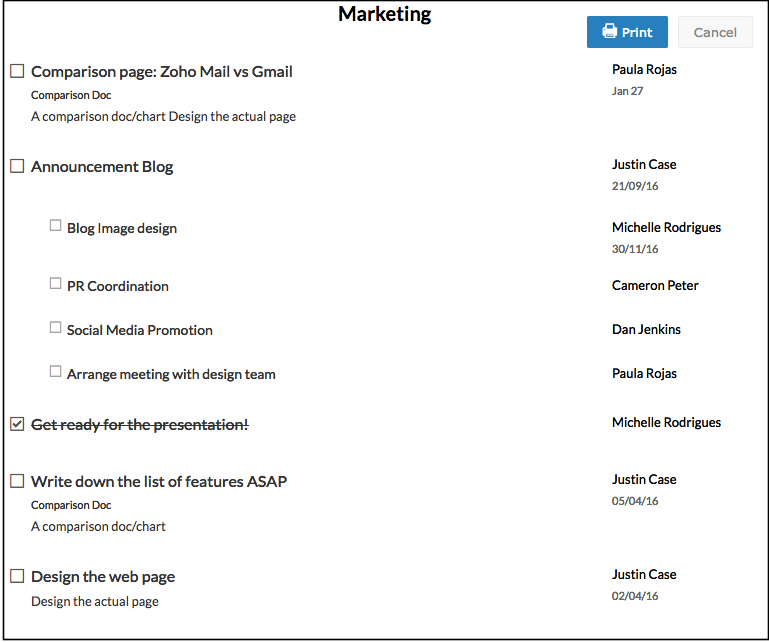 When you add Tasks or Notes from email, the tasks and notes will now be accessible right below the email. This better integration helps to contextually view the associated Tasks and Notes linked with the email and vice-versa. Details here! You can now share your files as link from Zoho Docs, instead of re-uploading them to your email. Avoid breaking your head to find out the correct version of files due to multiple copies with different versions. Easily share documents in progress as link, to get centralized reviews from your colleagues and make changes easily to the same document! Check it out. With just a few clicks setup zaps and automate your workflows between email and other applications. Zapier, a third party integration platform, helps automation by creating zaps between different applications. The latest integration between Zapier and Zoho Mail allows you to build your custom zaps which can automate 750 + applications with your emails in Zoho Mail. Read about it here! Schedule emails - Choose when and Send them later! Quickly compose the contents of the email and set up a schedule to send emails at an apt time for the recipient. Schedule helps you to send reminders or updates to your team at the right time, suitable for the task in hand. Instructions inside! Reminders and Follow ups - Better follow up your emails! Easily add reminders to email, that need to be acted on at a later point of time. This can be based on the response to that email or even when there is no response from the other end. Sometimes we just need to be reminded about that email at the right time. Our reminders provide options to all these scenarios and even more. Learn how! When writing an email, simply @mention users in the email body to directly add them as recipients for that email. 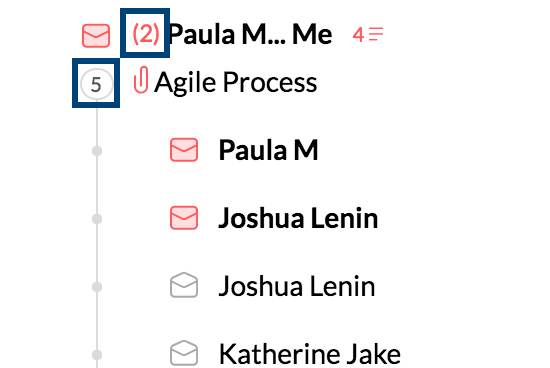 This helps you to include everyone related to that email, without the need to add them manually or miss them in a hurry! Email communication is the central and common factor that connects the businesses all over the world. At Zoho Mail, we focus on business communication indepth to empower our users with better communication and collaboration tools! We would love to hear your feedback.